My desk today looks very different from what I normally show. What you are seeing first is the new desk in my study.This has been designed to allow me to have the sewing machine out permanently, instead of, as previously, having to clear the computer keyboard before I could get out the sewing machine. So there is the machine with all the clutter for making bags for Uganda. If you want to know more about it go to Margaret's blog where she explains a bit about the bags. 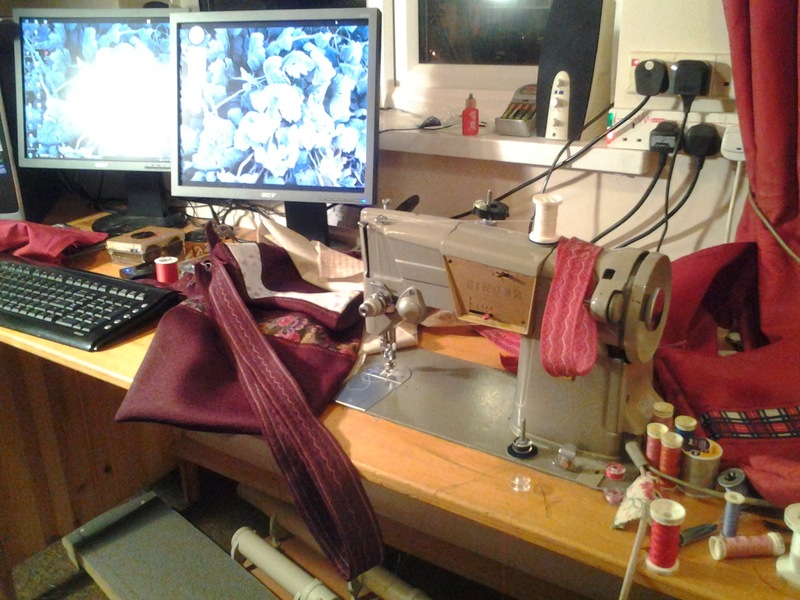 Making the bags themselves is very simple, it is the straps that I find so tiresome and exhausting. They are a metre and a half long and need machine embroidery all the way along to strengthen them. You can see a couple I have done the embroidery on, but gosh it is wearing stuff! I have promised to make twelve. Behind the machine you can see my monitors with pictures of frosted foliage. I think frosting on things is so pretty that, when we have frosts I can often be found outside, early morning, in my dressing gown, trying to get the best pics before the sun has melted the icing on the plants and before I freeze to death. 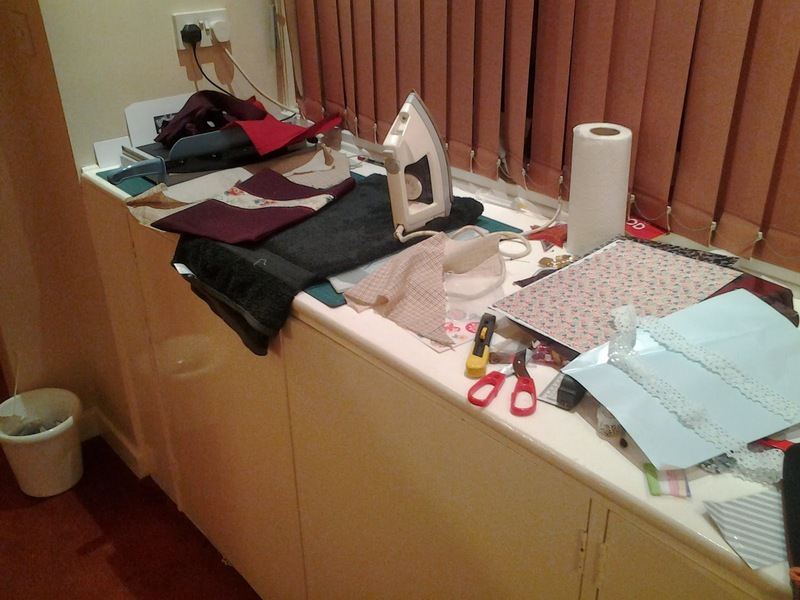 Here now is my cardmaking surface doubling up as an ironing surface for the bags, but there are a few bits of cardmakings, pale blue paper and matching lace. Haven't made any cards for over a week now because of the intruding bags. Note to self, must make time to do some cardmaking soon, grandson's birthday in just over a week. 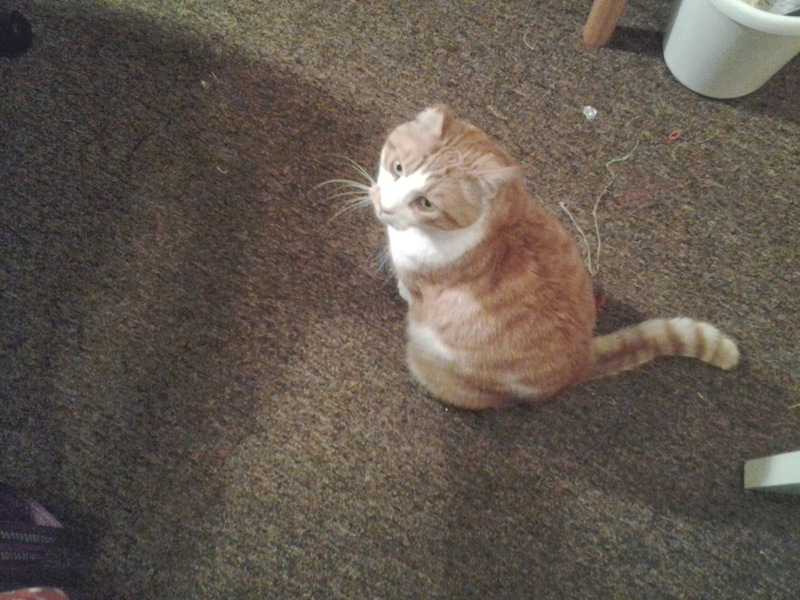 And here is Max wondering why I am fiddling around taking pictures instead of cuddling him as is his due. If you are wondering why I am exposing my all, in crafting terms anyway, nip over to the lady Julia, where all will be revealed. Well I must get back to the machine and get stitching. Cute kitty and lovely bags ... I always find the lovely things are always made with lots of detail. Oh, Chris....if you could only see the amount of cut outs, unfinisheds, oh I should really finish thats..........it's quite embarrassing! So you are in good company, lol!! 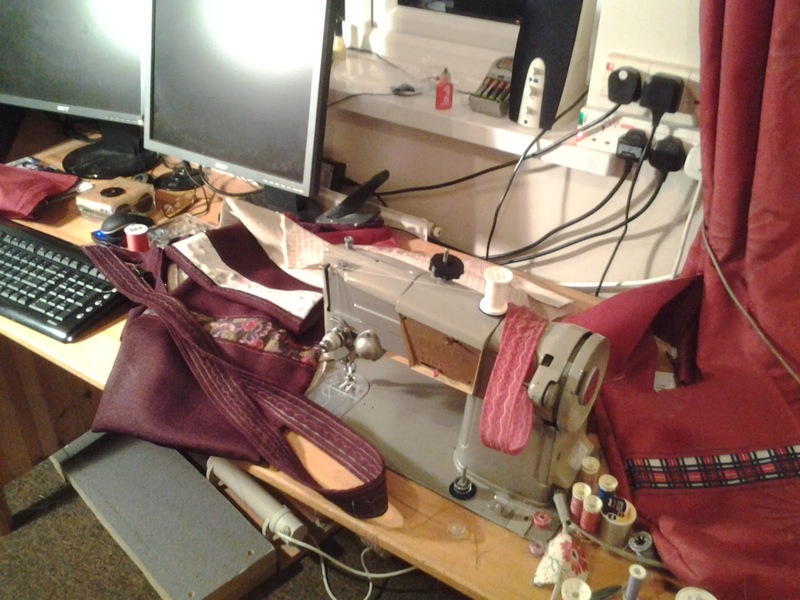 I know just what you mean about straps...is, they're so tedious to make...a bit like knitting arms for adult sized jumpers, they go on and on and on...... They are my least favourite part of making totes, that's for sure! Ah, a labour of love really, huh - 24 handles - it will soon be over and remember how appreciated they are! Like your embedded machine...I'd like to have mine out permanently too, but I deeply suspect it would just need dusting! I am sure they really love all the good work you are doing for the Uganda people. But Max has stolen the show, sorry to say he is one really handsome putty tat, give him a cuddle from me. I hope you have a productive crafting week and don't forget to make that birthday card. I'm impressed with all the bags you are making! Your craft room looks nice -- I like the tables. I also understand how you feel about the snow. I moved to NC a few years ago to get away from the cold in WV, but I really miss the beauty of the white snow. (NC actually got snow last week!) Your cat really stood out to me. I, too, have a cat that looks like the same color--so beautiful! Where would we be without our cats? Mine jumps up to the table and watches me craft. Love it! 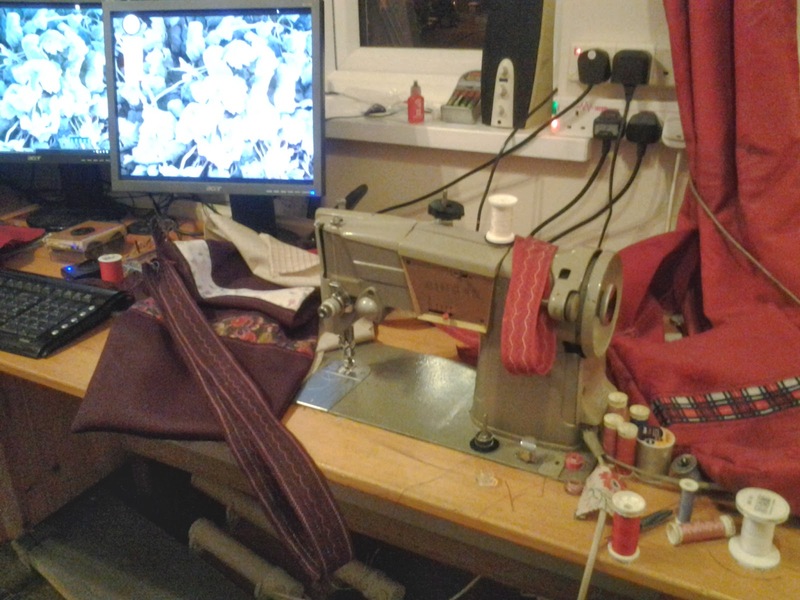 How nice to have a permanent place for the sewing machine. Love that it's level with the table, too. 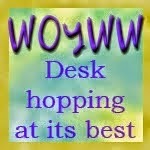 Thank you for your visit Mrs D. You have a very professional desk going on there. Isn't Max gorgeous? cute kitty! Looks a lot like my orange cat, Penny. But she mostly sleeps at 15 years old!